IGC secure flight recorder, approved for all flights. All ADC's, including earlier build versions, also include advanced 3-axis inertial and magnetometer capabilities that will be utilized in future by ClearNav variometer systems. Accelerometers to enable gust filtering and other advanced capabilities. 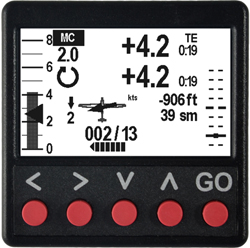 Also provided on the ADC are switch inputs to allow the system to provide gear and spoiler warnings, connection to one or two speakers, a USB port for downloading flight records from the IGC flight recorder and CAN bus and serial port connection to ClearNav Variometer Displays, ClearNav Navigator Displays, and third party flight computers and soaring software. The CNv continues the ClearNav design philosophy of providing robust and configurable products which are simple to use and require a minimum of heads-down time in the cockpit. CNv ships with a complete package of hardware and software which now come standard with an IGC secure flight recorder. Additionally it provides navigation display, task editing and serial data out to drive third-party navigation. The CNvS climb screen is displayed in the photo on the left with the thermal assist screen shown directly below. A view of all screens can be seen in the user manual. 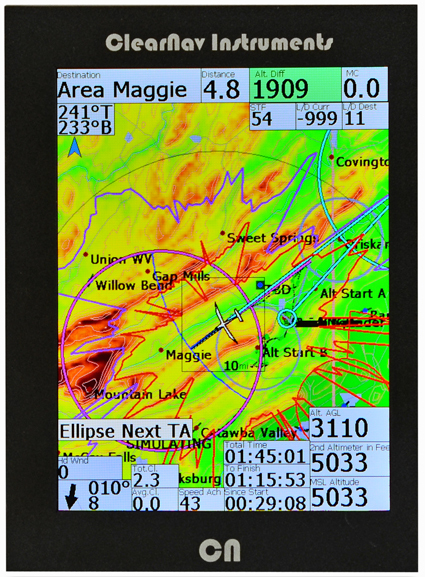 The CNII is a no-compromise integrated cockpit navigational instrument and display providing full situational awareness for glider pilots. Copyright © 2018 ClearNav Inc.